I had my first drone about three years ago; it was a medium-sized drone with a crappy camera. The specs were decent, but I had one problem - I don’t really know how to fly one. 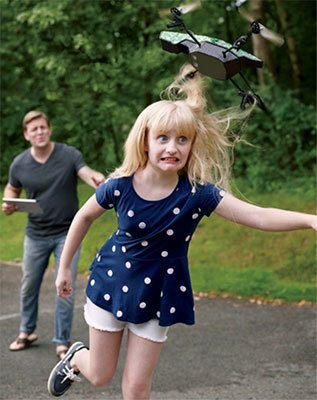 At that point, I knew that spending more than a hundred dollars for a “training drone” is a bad idea. To help you on your first step in getting a decent drone, I’ve reviewed several nano drones that are in the entry-level category. 1.7 Cheerson CX-10: I love its Orange look. Good things come in 7. Seven wonders, colors, even sins. Here are seven decent entry-level drones which may help you in your quest to become an ace pilot. Great training nano drone for beginners. Headless, foldable, affordable. Perfect for children and beginners. 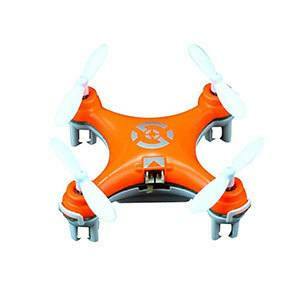 The Q4040 is probably one of the best drones in the market priced more or less $30. The TOZO Q4040 packs a lot of punch considering that it weighs a little less around 1.5 ounces. Being able to perform 3D rolls in the push of a button is just the tip of the iceberg. With the Q4040 Boasting a flight time of 8-10 minutes after an hour-long charging, this drone will give you enough time to get the hang of flying. The best feature however for me is the Emergency stop button which immediately lands your drone, safely bringing it down but not for the count. Substantially long flight time for a drone that weighs so little. Easy to use, has Headless flight mode and is foldable so you can put it in your pocket. Does not have a One-Key return home option. Propellers do not have guard rails. Takes a substantial amount of skill to fly efficiently. Here's a video of the Q4040 in flight. For a drone which has a 30-minute charging time but a flight time of 8 minutes, the GP NextX F8 is perfect for people who are itching to take flight. It also has bright and colorful LED lights which makes it great for nighttime flying. Great nano drone for beginners. You can pilot it around 30-40m range, and the transmission is still okay. It’s reasonably priced too, given that most drones are well over this range. However, it falls second on our list because of my issue with its durability. The guard rails are too fragile which is an issue since training drones are supposed to be able to take a substantial amount of beating. Nevertheless, it still is a decent drone despite its drawbacks. Just be extra careful. Easy to maneuver. Controller interface is user-friendly. Has a colorful LED mode which makes it visually appealing. Comes in Chrome which gives it a metallic look. Despite boasting a sturdy framework, it doesn’t deliver on endurance. Small, too small that you’d have difficulty looking for it by daytime. Charging port tends to loosen up pretty quickly. 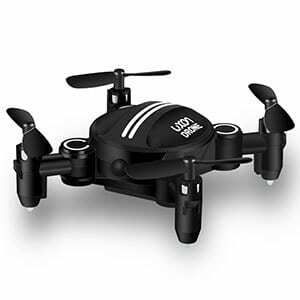 The LUXON 2017 is the embodiment of the word Pocket Drone. 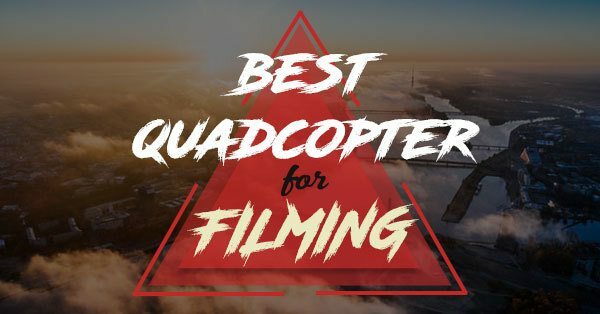 It did well-getting 3rd on our best mini drones list. Having a foldable feature and a rounded design, this fits snugly in the pocket. Coming in Black and having LED lights, the drone gives the user the perfect nighttime flying experience. You get your money’s worth with the very affordable price tag. It does 360 degree turns and flips just like most drones so you won’t have to worry about tricks. A major issue I find here, however, is its flight time. It fully charges for 40 minutes and only delivers a decent 6-minute flight. The maximum range of the thing is capped at 30 meters, so it’s still a pretty average drone. Nevertheless, it compensates for its durability and price so you won’t have to worry too much about breaking anything since it is tough and you can always buy a new one. Affordable. Reasonably priced but delivers. Compact build means you can carry it everywhere. Average flight time. Not one for endurance. Kind of difficult to control the first time around. Transmission range is only under 30 meters max. 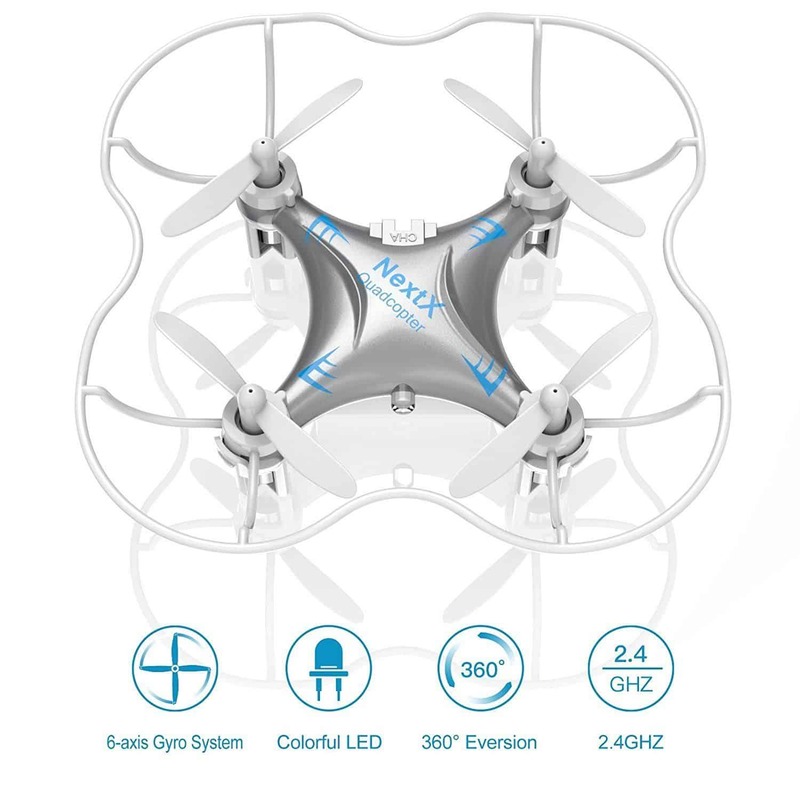 Now if you’re after aesthetics, then this is probably the micro drone for you. The Q2020 is an older model of our top pick the Q4040. 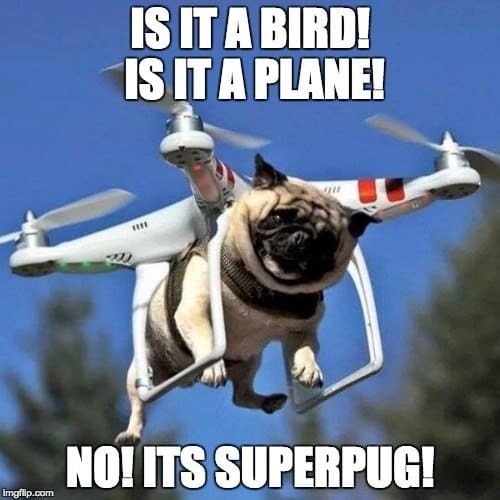 This drone has almost the same features as its newer model. Having an Altitude Hold Mode (Hover) in its system and an Emergency stop button, the drone makes it to the list because it looks...cool. The encased propellers are actually the feature I love the most; you can show it off to your friends even when it isn’t airborne. However, the reason it isn’t higher on my list is because of its sad excuse of a battery life. Though it is supposed to have an 8-10 minute flight time, it only flies for a good 6 minutes (8 at best), and I find it a bummer. And if you’re planning to spend more or less 30 dollars on this, go for the Q4040 instead. Aesthetics. The design is more than enough to impress even without flying the thing. The rounded propeller design also serves as an anti-collision feature which helps in protecting your propellers. Headless mode helps you control it much easier. Helpful for beginners. Battery. Flight time doesn’t deliver as promised. Doesn’t have one-key return button. The controller feels a bit off from usual designs. If you’re sick of the usual black and white and want to go for something else, then the EACHINE E010 might just be your thing. 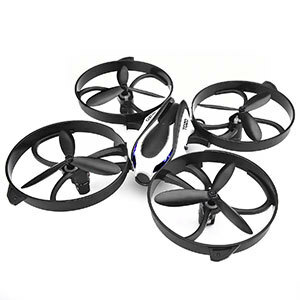 This mini drone is designed just like the Q2020 with its propellers encased in a round frame. It has a one-key return button and is light at 1.76 ounces. The E010 is beginner friendly since it operates mostly in headless mode. The drone is also upgradeable with a camera so it can also be your entry level photography drone. It doesn’t make it far up the list because of issues with its battery. A full charge requires 30-50 minutes but the flight time is only 5 minutes at most. Think about adding an extra weight such as a camera with the substantially low flight time and you’ll get even shorter air time. Plus, the transmitter is not that good at transmitting. Since most Wi-Fi routers operate in the 2.4 GHz bandwidth, it pretty much scrambles the whole connection between the controller and the drone. Looks good. Color scheme is unique. Rounded guards. The guards protect the propeller from obstacles. Upgradeable. Features don’t end in flying. The Tenergy Syma X20 is practically a decent drone. It can probably do the same thing as most mini drones such as flips and auto-hover. 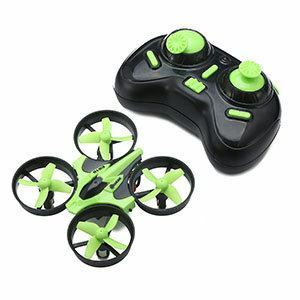 It is one of the best drones for beginners. Heck, it even has a one-key takeoff and land feature which is useful for beginners. Why isn’t it at the top? The moment I tried to charge the X20, the charging port just sank inside the drone’s body. Though it did well at the moment, we got the X20 going because it is indeed beginner friendly and the thin manual pretty much says it all. Unfortunately, the 5-minute flight time isn’t doing much to compensate for it being pricey in this drone class. One touch Take-Off and Landing Button. Charging port issue. There’s nothing you can do here. The frames on the propellers don’t do anything. They’re just there for aesthetics. Cheerson CX-10: I love its Orange look. I love it because...it's uhhh...orange, I guess? The bright orange colored Cheerson CX-10 is indeed a sight for sore eyes. Seeing a brightly colored drone floating around can surely cheer anyone up. It has a pretty neat design and is a perfect gift item, assuming it even takes off. There is a reason why it’s at the bottom of the list. When I tried the Cheerson for myself, I immediately found myself frustrated with the fact that the charging cable doesn’t fit. What good is the color if you can’t even charge it properly? Aside from that, when I got it to fly, it doesn’t operate stably as to what was advertised. The feeling of the drone crashing lingers the longer it’s airborne. The flight time was okay with reaching the 6-7 minute margin, but that’s not enough especially with its fragile construction given that it should last longer since we’re looking at training drones here. I believe that the Cheerson would’ve been a decent drone if only its charging ports/cables were compatible. Weak and brittle build - it won't last long. 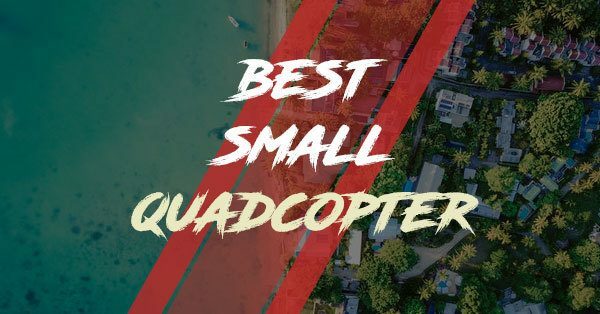 Before going online and ordering your drone, you have to consider factors in selecting the best micro drone to buy. There are many things to consider, but I’ve named three of the essentials for you to get your money’s worth. Flight time is probably the most important factor to consider here. I cannot put enough emphasis on why you should be mainly considering flight time as an aspect of picking your drone. 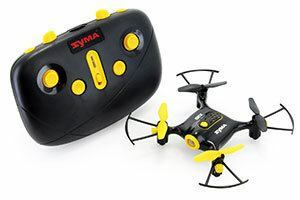 Just put it this way, your purpose in buying a mini drone is mainly to train yourself in piloting a bigger and more expensive drone in the future. Having a longer flight time means that you get to practice more after charging your batteries. Plus longer flight times mean that you will be able to do more maneuvers in one go of a fully charged battery. Even if drones offer long flight times, extra batteries are still worth buying. Most manufacturers provide spare cells and, most of them are readily available. Avail of these extras to make the most out of your drone experience. If you don’t have any problem frequently ordering new drones because your old one just broke, then don’t read this part. If not then read along. Another important thing is the whole framework and makes of your drone. Assuming that you probably are a neophyte pilot, it is a given that it will be a bumpy ride till you master your drone. Giving importance to the materials used to make your drone and how it is constructed means that your drone can take a beating and still perform efficiently because it’s made to last long. The longer it lasts, the longer you fly. Last but not the least, the Transmission is a factor in selecting your drone. A more extended transmission range means that you can take your drone farther and higher. It also means that there is more room for you to fly your drone. Aside from the range, the integrity of the transmitter’s ability to deliver is essential as even a lapse in the communication between your controller and the drone can have significant consequences especially if your drone is air-borne. Ensuring that the controllers have no problem with the presence of other controllers in the area or bandwidth is essential so that you will be able to fly in peace. 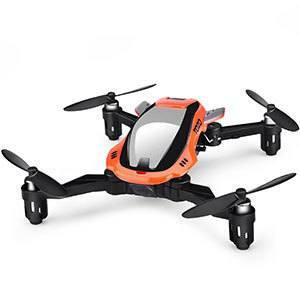 Overall, The TOZO Q4040 our top pick among other mini drones on our list. The Q4040 gives us the most important factor in learning how to pilot a drone; Flight time. Not only does the drone give us a staggering 8-10 minute airtime, but it also has an emergency stop button which lands it safely saving you a click for another unit order. The transmission distance, available flips and built-in maneuvers, and its compact design certainly gives you your money’s worth and more. Drones indeed have changed the new definition of the word Toy. Technological advancements certainly paved the way for drones to be commercialized and be available to the public. Drones indeed have become cheaper, available, and easier to use. Despite this, purchasing professional models right off the bat without proper experience and prior knowledge about drones is not advised since money isn’t easy to come by these days. This reason is why entry-level drones are available for you to practice on before you fly the big boys. With enough knowledge, understanding, and practice, soon enough you will make drone piloting your second nature. 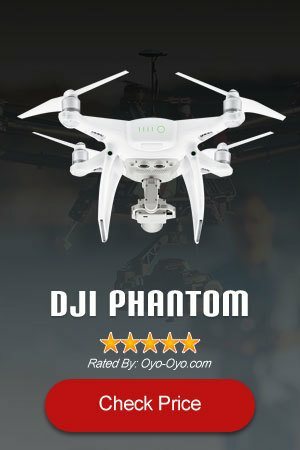 So if you’re looking for a drone to start with, sure enough, the list will give you everything you ask when looking for the best mini drone.